We’d love your help. 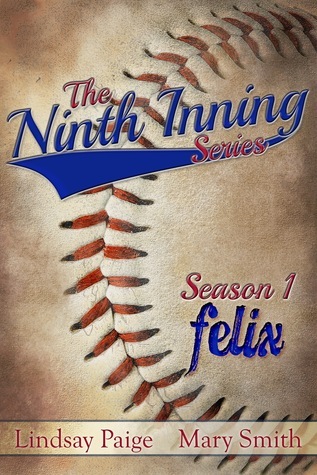 Let us know what’s wrong with this preview of Felix by Lindsay Paige. Relying on her sisters most of the time, Abigail Harris is trying to put her life in The Ninth Inning series presents Memphis Angels’ pitcher, Felix Hernandez. To ask other readers questions about Felix, please sign up. Abigail and Felix story was amazing. These are the most difficult kind of reviews to do. The ones that are OK. I can’t go full out on why it so didn’t work and I can’t praise it and tell everyone they simply must read it. I guess the best I can say is it’s a baseball romance I read just before the start of the World Series – since the Jays are out – Go Cubs! Felix Hernandez is a pitcher for the Memphis Angels. It was never explained whether this was a major league team or a minor team. I think that might have been helpful to know. He meets Abigail Harris at a book signing. Now Abbie isn’t all gaga over him but her sister tries real hard to make a love match. Things are made easier when it turns out that Felix and Abbie are neighbours. Things go along. They get to know each other. Felix asks Abbie on a date and then forgets all about it since he’s consumed by baseball. He feels bad. To make up for it, Abbie insists he become her driver whenever possible because she suffers from some PSTD when she and her parents were in a car accident and they were killed. She hasn’t been able to drive since. And that’s pretty much the story. It’s all rather bland. The characters are nice enough in a bland way. There isn’t any real conflict other than Felix forgetting about things because his mind is on baseball and Abbie’s issues. There is another guy she’s also dating at the same time but not even this adds conflict. One thing I did note, being the baseball fan that I am is Felix got a no hitter for the first game he pitched. Now I’m not saying this impossible but it is HIGHLY unlikely as they have such things as pitch counts, especially at the first of the season and for a pitcher to go all nine innings is very rare. Because of his and the fact that Abbie is at his first game, he insists that she’s his good luck charm and has to be at every home game, do the same routine, wear the same clothes etc, etc. It’s all rather, well, bland. This first book of the series was free and I was glad of that. I have a huge number of books to read and because of this, sadly, I don’t plan to continue the series. So we all know how much I love baseball. I mean I was an Astros fan when they were the Lastros :( I was totally looking forward to this series. I love the sport themed books that Lindsay Paige and Mary Smith do together. So far they have all been about hockey so I was interested to see how they pulled off the baseball books. I am pretty happy with it. Felix is a pitcher and by pitcher I mean an amazing pitcher. He finds his good luck charm and then makes sure that she is there at his games to ke So we all know how much I love baseball. I mean I was an Astros fan when they were the Lastros :( I was totally looking forward to this series. I love the sport themed books that Lindsay Paige and Mary Smith do together. So far they have all been about hockey so I was interested to see how they pulled off the baseball books. I am pretty happy with it. Felix is a pitcher and by pitcher I mean an amazing pitcher. He finds his good luck charm and then makes sure that she is there at his games to keep his luck going. Baseball players to tend to be extremely superstitious so I like that they got this into the book. I like Felix and he was a pretty good character. I liked Abigail too. I liked that she was not falling all over herself for him when she found out he was a baseball player and the fact that she played along as his lucky charm. Both characters had some issues to deal with and there were times I wanted to strangle them both but they redeemed themselves. I am giving this book 4.3 stars out of 5. Abby has a great relationship with her sisters. Felix has a good relationship with Thank you Lindsay for the opportunity to read this ARC for my honest review. There are times as a reader when you want a simple story , one where the plot and characterizations are not too complicated . This was almost too simple . I've enjoyed Lindsey Paige's writing in the past , mostly because of her subtlety . This was a very weak effort . I found the story hard to get into and the writing style very sophomoric . This does not bode well for the rest of the series . I'm sorry I didn't like it more . The story line was definitely there. With baseball being my favorite sport you can never go wrong with that. Definitely gonna read the next book. I do hope it has a continuation of this one. Would like to have known how the couple ended up other than in love. Abigail is annoying!!! That being said, if Felix was dating two girls at once he would be a bad guy!!! I guess it's ok for the h. But I didn't like her.